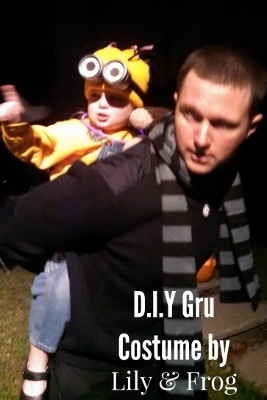 Do your kids LOVE Despicable Me? Zach & Lily are obsessed! 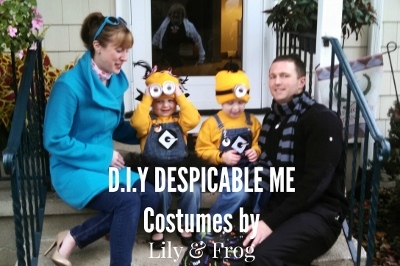 For Halloween Zach asked to be Gru from Despicable Me, which I though was uber adorable, especially when I had the ‘evil genius idea’ to create a Lucy Wilde costume for Lovely Lily! After a quick re-planning of my initial plan; I re-assigned characters to the kids, incorporated Andy as Gru, the former villain turned good guy and myself as Lucy Wilde, the Anti Villain League Agent and Gru’s Love Interest. 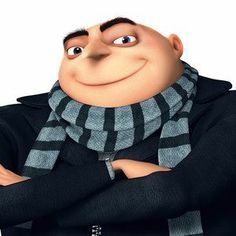 I placed a call to a Dear Crafty Friend for a few D.I.Y Minion costumes, started sewing up a storm and supply shopping for a husband-size Gru! 1. The Ensemble: Rummage through your closets, donation centers, or online shopping… Designing and sewing anything for this costume really isn’t worth it, because the clothing is pretty basic, I swear! Black Coat: Andrew has a black zip-up sweater in his closet. 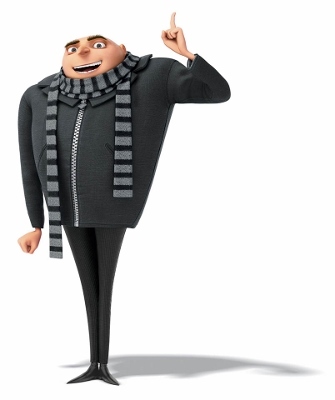 I know a sweater isn’t a coat, but is it really that big of a deal if it isn’t perfect… We are still getting the full Gru Effect. Black Slacks: I grabbed a pair of Andy’s black pants for this one, no fuss no muss. Black & Grey Scarf: This was a purchase from amazon.com, Premium Soft Knit Striped Scarf. Andy doesn’t own scarves, this is why I didn’t mind making the purchase here. 2. The NOSE: This one was a little tricky, I called in my dear Crafty Friend for help on this one little help. 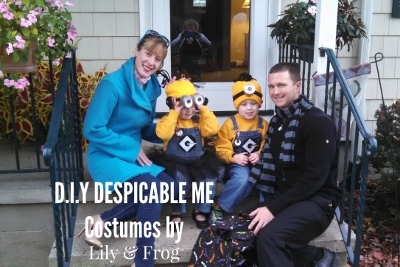 She was perfect for this project because the Halloween before she, her husband, kids, and family friends were a whole Despicable Me Crew. Purchase some skin tone color felt, cut and fold it onto a cone shape (like an ice cream cone), hot gluing the edges together. Now to stick it onto the husband’s nose… I was ALL about taping that honker to Andrew’s nose, but she suggested Breathing Strips, much more ‘Husband-Friendly.’ Hot glue the Breathing Strip to the interior of the cone and where the bridge of his nose will be. Once cooled, peel away the backing and stick the felt nose on his nose. In our case, I brought the nose along for the ride, it never made appearance on his face. Hey, no fuss-no muss right… his costume still pulled together quite well in my opinion. This was one of the easiest costumes I have put together… And Andrew didn’t mind Rockin’ it the WHOLE evening – A WIN for Wife! 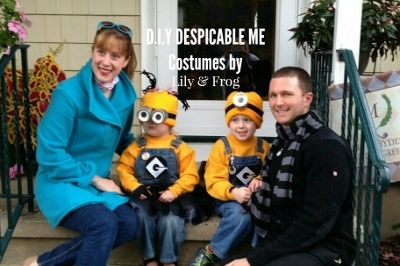 Categories: Crafts & Projects, Kids' Costumes, L & F Products, L & F Services & Products, Uncategorized | Tags: Character Costumes, costumes, Crafts & Projects, Despicable Me, DIY HAlloween, DIY Halloween Costumes, Easy DIY Costumes, Elizabeth, Family Costumes, Gru, halloween, Halloween Costumes, kid's costumes, Kids’ Costumes, L & F Products, L & F Services & Products, Lucy Wilde, Minion | Permalink.